Not long ago I attended a lecture at Bowling Green State University as part of their “Beyond the Dream” series in conjunction with Black History Month. The speaker that evening was Opal Ayo Tometi, one of the co-founders of #BlackLivesMatter. Her speech and dialogue with the audience was inspiring, thought-provoking and to me more than a little unsettling. Since hearing her speak, a little over a week ago, her words have tumbled over and over in my mind, causing me to reflect upon my own fallacies, biases and re-evaluate how I can be on the just side of history. Tometi said that we are living in a history-making (with a capital “H”) moment in time. She talked about some of the other capital “H” time periods of the past. Like her, I can remember sitting in history classes learning about the horrible injustices and tragedies of our past. I too, read about the underground railroad that helped people escape from slavery, the bravery of Rosa Parks, who refused to give up her seat on the bus and the senseless, horrific murder of Emmet Till. I tried to picture what life would have been like back then and who I would have been. Would I have been brave enough to be part of the underground railroad? Would I have marched in solidarity with the people in Montgomery? I would like to unequivocally say of course I would have! I know that I would have seen the injustice, but I’m not so sure that I would have been brave enough to stand up to it. I was relieved to think that at least these atrocities and injustices were history. They were events that happened before I was born in a “different” time. Yet I only have to turn to my Twitter feed to be reminded that these types of atrocities and injustices are still very prevalent in our society today and that I am living in “this” time that will some day be my grandchildren’s “different” time. One of the talking points that Tometi hit on hard was that acknowledging injustice and being aware of injustice is not enough. She went on to say that if you are silent and do nothing (even if you are not the perpetrator of the injustice) that you are complicit. Silence equals complicity. Those words won’t stop haunting me. Those words were my wake up call. From my earliest blog posts/newspaper columns, I’ve tended to focus on the silver linings of life, the little things that make you feel warm inside and smile. I’ve tried to avoid writing about topics that stir up feelings of anger, pain and despair. My philosophy has always been to remain uninvolved and refrain from commenting in social media or sharing my opinions in conversations if they differed or would cause conflict. My notion that if I quit reading the news, stopped following people whose opinions were different than mine and just kept my thoughts/comments to myself I would be a lot happier was shot to hell by that statement – silence equals complicity. My conscience won’t allow me to be complicit. I want to not only acknowledge and stand against the many injustices in this world, but I want to make a difference and do what little I can to bend the arc towards justice (even if it is just as small as writing a blog post like this one). I would never in a million years consider myself an activist. I am an introvert with a loathing toward conflict. In my mind, conflict has always been bad, but complicity is worse. So on this last day of Black History month, I vow to myself to stop being quiet and speak up against injustice of all kinds. I admit I’m afraid, but my “ignorance is bliss” or “if it doesn’t affect me directly, it doesn’t matter” mentality scares me more. Do you remember kindergarten? How about when your children or grandchildren were in kindergarten? No, not really? Is it all a bit foggy? Surely, though while we may not actually remember being a kindergartner, we do remember what we learned at that young age. And while, what we learned in kindergarten became the foundation of our education, I think especially now after a week filled with so much hate and violence, we could all use a refresher course. Listen when the teacher (or someone else) is talking. While all of these “rules” are important, I find that #5 may need the most review among American adults today. Even as precoicious 4 year-olds, my daughters both knew that the word “Duh” was disrepectful and that the word “stupid” was a “bad” word and would call me (rightfully so) out if I used one of these words. Yet, when someone disagrees with one of our values, beliefs or opinions, many of us are quick to assign judgement and call each other names. I passed this political sign (to the left) on my way to the dentist this afternoon. I felt physically ill as I passed by. I am glad that my youngest daughter wasn’t in the car with me to read this hateful sentiment. While it is a wonderful example of alliteration, it would have been distressing to explain to her what a douche bag and douche are, and even more so to try to explain to her why these words were being used in this context. I am not offended by this sign, but am disappointed and saddened by it. A more effective sign might have been to tell me the positive reasons why I should vote another way instead (Republican maybe?). The writer of this sign does just the opposite of what his or her intent was – to influence me not to vote democrat. Yet, the off-putting aura of hate that surrounded the message makes me want to vote democrat even if I weren’t intending to before I read it. While I whole-heartedly support our right to free speech as proteted by the first ammendment, even the Super Bowl halftime show is censored and music, videos and movies are rated based on content. I do not agree with the content of that roadside sign or for that matter of various tweets and contents on any given social media platform, I would never call the author a nasty name because of it (even though I may momentarially think it). While the old childhood rhyme may be “Sticks and stones may break my bones, but words will never hurt me.” They do. Words do hurt. Words instill hate in our hearts. Words insight violence. Words matter. Last week my daughter was upset because someone in her class supposedly her a “mean name.” We talked about the saying of “I’m rubber and your glue whatever you say bounces off me and sticks to you.” As Taylor Swift sings, “Shake it off” as the “Haters are gonna hate, hate, hate.” We agreed that when someone calls you something mean, it’s more about their lack of self-esteem than it is about her. This is true. It doesn’t matter what people think about you in theory. But pratically, speaking I can replay in my mind more exactly the hurtful things people have said to me more easily than the positive ones. While I shake it off, a sliver of pain is still left behind. Words can inspire. Word can affect positve change. Words can lift us up. Are there any other kindergarten rules you think we should revisit? When my oldest daughter was around 3 years old, I went on a girls’ weekend with my mother and sister. I left my daughter with her dad. He was on call that weekend and wouldn’t you know it, he got called into work. He asked a neighbor boy to come stay with her. Not wanting to wake her, he left without introducing her to the babysitter. She woke up to a virtual stranger, terrified. The babysitter called my cell as he couldn’t get her to come out from under the covers or to stop crying. I tried to comfort her over the phone, but could tell from her whisper of a voice that she was still afraid and I was four hours away. Grandpa came to the rescue that day (as he was only 45 minutes away). The pain and distress my daugher felt that day shot through my heart. It took her several months, if not, longer to get over it. I felt like the worst mother ever. Would I have knowingly, on-purpose caused distress to my child? No way. Unless…her life was in danger, then absolutely. This is why I can understand why immigrant families come to our border knowing they could be separated from their children – better in an internment camp than dead? I can’t imagine how horrible the conditions must be in their home countries that they would rather their children live without them in a foreign country, than die with them in a country overrun with violence. Sure I could be separated from my children, if I committed a felony or was deployed in the military, but in both cases the decisions would be mine. One could argue crossing an imaginary line in the sand is a choice as well, but is it, if the alternative means death for my children? This is called empathy. Would I make that same decision in their place if it meant my children would live? Yes. What would you do? In my heart of hearts I never wanted to be the one that passed by someone in need with a cold, hard heart. I strived to be like the Good Samaritan (another parable ingrained in my mind). In my mind I really wanted to be kind-hearted and help those less fortunate than me. I grew up believing in loving my neighbors as myself and in praying for my enemies. This is where I learned about empathy. “What would Jesus do?” Do you remember those bracelets from back in the 1990s? I had a green one. A few months ago a woman approached me as my daughters and I were getting out of the car to go into the mall. She asked if I had any spare change to give as she’d run out of gas and didn’t get paid until the following week. I gave her what change I had in my pocket and knew my daughter had $10 in her coin purse. I asked her to give the money to the woman. She reluctantly gave the woman the money, who was very grateful. I assured my daughter I would pay her back the $10 as soon as we found an ATM. Yet, she was still salty (yes I just used teen lingo there) over the whole episode. I asked her what was wrong as this is my child that has bible verses posted on her bedroom walls. I expected her to want to help others. As it turns out she thought the woman was scamming us or could have robbed us. I told her that yes, she was absolutely right. Both of those things could have been true. On the other hand, the woman may have been sincere in her need. I said I would rather assume she truly needed help. It was broad daylight and many people were around so I didn’t feel unsafe doing so. I told her I would rather ten people scam me, than not give to one person who could really use it. If I were in need (and I have been), I would and am truly grateful for those that have helped me. I share this story not to shame my daughter or anyone else for that matter. Her fears come honestly. We live in a day and age where our society assumes the worst in others instead of the best. Imagine what life might be like if instead, we assumed the best by default? I’m not a theologian or a philosopher or a politician, but I honestly think it would be pretty damn awesome. In my cheesy, alter-universe, we live in a world full of empathy, compassion, tolerance and love. We are all human. Each and every one of us. We all have the same basic human needs (anyone remember Maslow?) Why can’t we move away from fear and hate to love and acceptance? Whether you are a conservative, right-winger or a liberal, leftist, it doesn’t matter. We are all human. The right thinks the left is brain-washed and vice-versa. People shout “fake news” when the read something that doesn’t agree with whatever politician they support. In the end, we are in a quagmire. Yes, there are shades of gray. But there is also right and wrong. Taking young, innocent children away from their parents, who are only seeking a better life for themselves is w-r-o-n-g. I don’t care who put the policy in place (Clinton, Obama, Trump – I’ve seen all three in my news feeds today), it is doesn’t change it from being wrong. Two wrongs never make a right. Ignoring what is happening around us doesn’t alleviate our guilt, it makes us complicit. Our country was founded on immigration. My grandfather came here from Mexico with his parents, seeking a better life. He worked as a hard laborer, a migrant worker and eventually along with his parents became naturalized citizens. I wouldn’t be here today if they hadn’t sought a better life and to live the “American Dream.” (Even so, I had no control over where or when I was born and neither does anyone else, including the people we seek to keep out). We dehumanize the people who come to our borders, when we call them “illegals” or “criminals.” They want they same things that we want. I read this Tweet from our president and I weep. People are quick to comment and point fingers at each other, but fail to put themselves in someone else’s shoes. I read many un-related arguments to justify supporting this horrible policy (why are the Democrats mad, they support abortion? Why don’t they worry about American children instead of illegal aliens?) These arguments are beside the point and still doesn’t change the fact that what we are doing now is inhumane. For the record, I personally, do care about the American children living in poverty and orphanages and I think all human life is sacred (from the unborn to the criminals on death row) and I also think it is wrong to separate children from their parents. If we spent the millions (dare I say billions) of dollars earmarked for a wall or temporary camps for the displaced children and used it to help end poverty in our own country, to give those seeking a better life a path so they can become contributing citizens, we could make America even better. I know in the grand scheme of things, my little post means nothing and won’t change anything. But, if you shared this post to your feed, and someone else posted it to theirs, maybe the 1490 words of this blog post could make a difference. The best day of the year came today. OK, maybe I can’t equivocally deem today the best day of 2018 as we’ve really only just begun. I can say it will rank up there in the top 10 best days of the year though. THIS is the day, I long for most. Is it my birthday? No. Did I get a huge raise? Hardly. Did my children surprise me by spontaneously cleaning the entire house? Did you just spit out your coffee? Yes, I am laughing too. I am dreaming big there! So what might you ask, makes today, April 12, 2018, one of my top 10 best days of the year? Can you stand the suspense? Today is the first day the temperature made it into the 70’s, the sun is actually shining, and the Ohio winds died down to just a light breeze. You can’t plan for a day like this nor can you count down to it. It just comes seemingly out of nowhere. Bam! Spring fever has arrived. Yes, indeed it is those little things that make me smile. When I woke up this morning I had no idea, today would be that day. As I walked to the corner Shell Station to get my morning cup of coffee (and yes, I know it is cheaper to make it at home, but that requires 10 minutes less snooze time and yes I digress again. But, I do love parathenticals), it was actually spitting snow. Yet when left the building at exactly 5:01 PM, the sun warmed my face and the wind tossled my hair. I wore no coat or jacket and I was not cold. Not only that, but I actually had no one I had to taxi to an activity after work. Thus, I made a beeline to the local Ace and picked up a pair of fresh gardening gloves and a sharp snipper thingy (I do believe that is the technical term for that tool:)) I even threw in a few packets of wildflower seeds for good measure! I spent the last few hours digging in the dirt. I got out the rake and started in one corner of the yard. I cleared away the dried leaves from falls that were caught under the bushes and hiding my daffodils and tulips. I pulled out the remants of last summer’s tall grasses. I marvelled at the tips of green poking up through the moist dirt of plants whose names I don’t know. They are ready to burst through and thrive. Maybe I’m being a bit optimistic with that last part (this is me I’m writing about after all). My knees are dirty, my face is flushed and any passers by probably got to see more of my backside than they wanted (as even with a belt my damn jeans keep falling down. Now I know how plumbers feel.) I breathed in the fresh, warm air that smelled of spring. Oh yes! I am blissful. I feel invigorated. 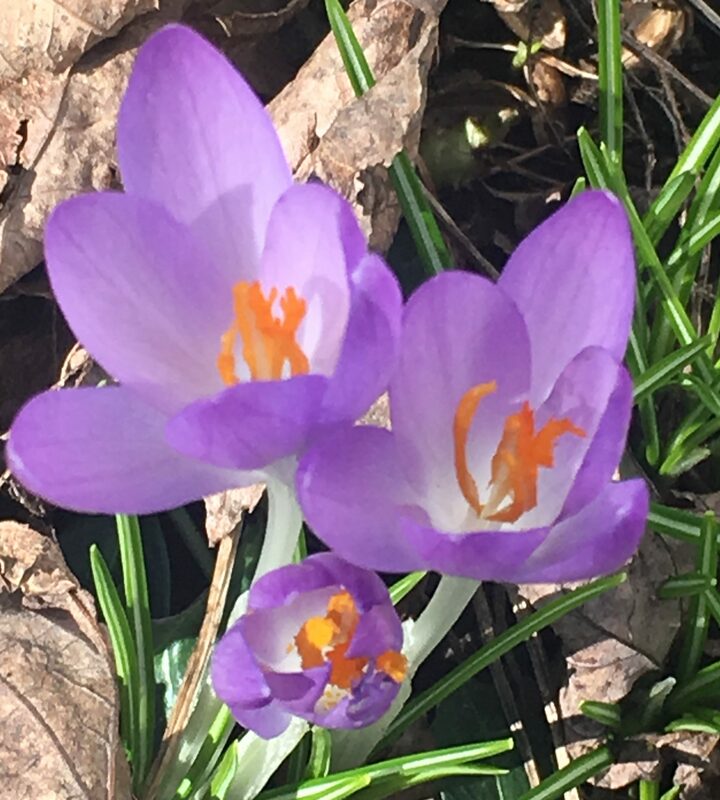 I have that spring energy, where when I look at my yard everything is fresh and has possibilities. That hot, sweltering dusty, dryness of late July is in the distance. I am not yet cynical and too tired to pull another weed or water my withered flower beds or fight another infestation of bugs. Right now, in this moment, I can see the beautiful blooms in my minds eye and it is gorgeous. Can you tell I love daffodils! Hey! Bring back my glove!!! Dirty knees and I don’t care! Seemingly everywhere I turn, I am attuned to the suffering, angst and overwhelming depression around me. If I focused too much on that heaviness, I could easily find myself wallowing in self-pity and inactivity; paralyzed and allowing fear to control my life. Is that living or merely surviving? Recently, I’ve felt more compelled to do something to further the causes that are important to me and not just be a passive bystander. Those of you that follow me may remember that my 2018 motto is “Be Brave.” What does that mean? Have I been too fearful? Maybe. More like timid. In the past, I often found myself holding back to keep the peace. But why? We all know life is not black and white. Free thinking and the freedom to learn and grow allows for change and betterment. It’s those shades of gray that make life interesting. So, for me, being brave, is letting people know my authentic self. It means to take risks and speak (or write) my mind without worrying that someone, somewhere might be offended or not like me because of it. This was and is a huge, step for me, but one that feels incredibly right and liberating. Discussion and differing view points are what allows us to come together as a community to find a meaningful solution instead of a “knee jerk” reaction or passively leaving it to someone else to decide. Having a voice, being informed and taking a stand, while listening and being respectful of others is the key to making a difference. It’s no longer enough for me to passively let “them” determine my destiny. 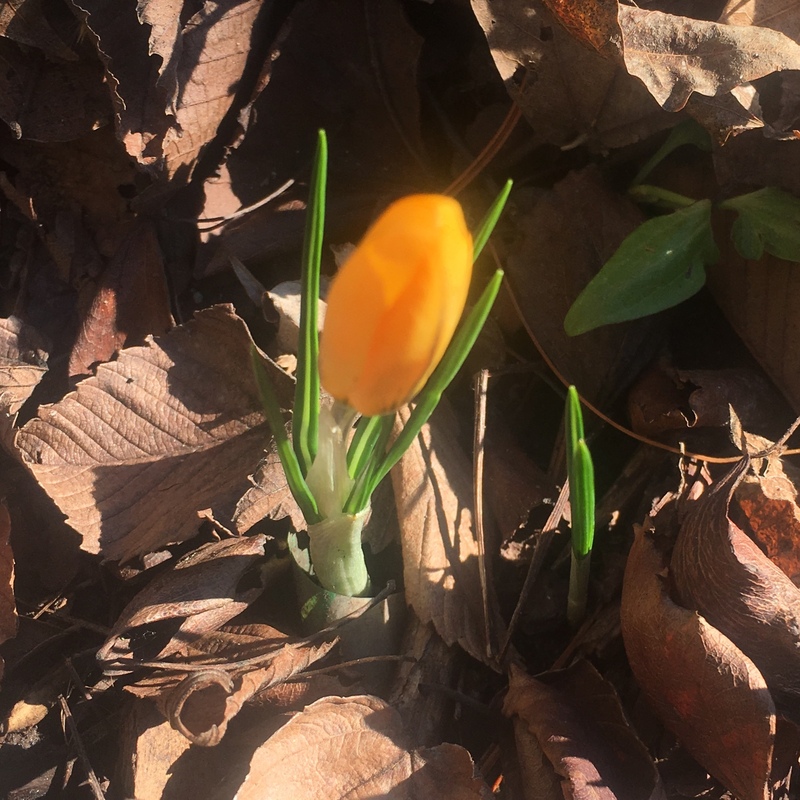 While issues big and small weigh on my mind at any given moment, as the title of this blog (“serendipity”) implies, it’s those little simple surprises that remind us to smile, to be grateful and to always hope. So as the ides of March sets, I bring you the hope of spring and the promise sunnier days will come. 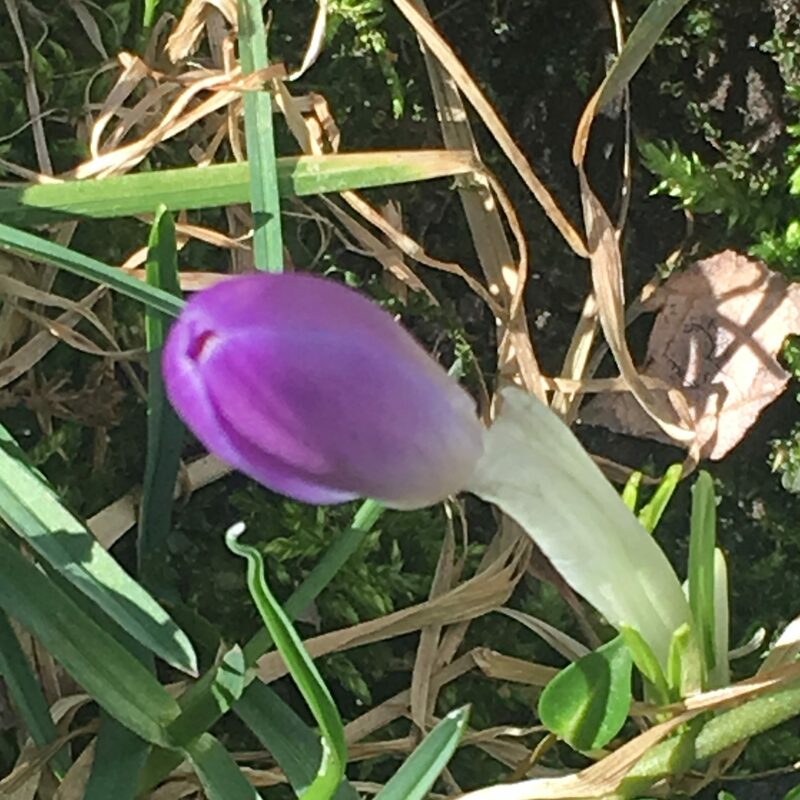 The first flowers of spring, sprout and bloom despite being frosted and snowed upon as the edge of winter recedes. And, now I just need to spot my first robin. Always hope. Posted on February 18, 2018 February 19, 2018 Categories Social Justice IssuesTags bullying, GunReformNow, MentalHealthReformNow2 Comments on People Problem? Gun Problem? Yes and Yes.